This month’s cruise news (and ON TOUR) is essentially about Crystal and Crystal Serenity in particular but we could not resist an honourable mention for P&O Australia who made history on 25 November when it simultaneously christened two new ships via social media and held its first five-ship parade in Sydney Harbour. At five in the morning – Pacific Aria and Pacific Eden joined the line’s three resident ships – Pacific Jewel, Pacific Pearl and Pacific Dawn – in a V formation at the Heads of Sydney Harbour. The Five Ship Spectacular marked the first time five ships from the same cruise company have simultaneously sailed into the harbour. BTN has never been happy with the constant renaming of ships, and since an invite to Oz is unlikely we can tell you more. P&O Australia is part of the Carnival Corporation and all the ships have been sourced from sister companies. Crystal Serenity is rather like a bottle of fine wine. It may be now 12 years old but it has matured (after all it is French built) and epitomises all that is best in cruising. Coming in at 68,000 tons, just 1,000 passengers, and 650 crew it is as perfect a cruise ship as you can wish for (and of course the winner of all the various awards). Smaller luxury vessels can arguably offer even finer specialised services (although the dining leaves most London top grade restaurants far behind) and there are huge monster vessels with ice rinks and bowling alleys, but the show time entertainment on Serenity is worthy of anything at Las Vegas, 42nd Street, or the West End, and since she is only 820ft long nothing is too far from your stateroom. Three sets of lifts (elevators) means there is no waiting if exercise is not for you, and unlike other ships (even 5-star ones) the balcony accommodation is spread over only four decks. Getting to where you want to be is very easy. 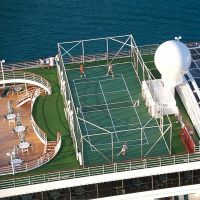 No cruise ship is going to completely cover for every demand, and the market is very international, but Crystal Serenity is as near perfect as you can get. With this particular voyage about one third of passengers came from the USA, with Japan (10%) next up, followed by the UK, and then Canada. What is the secret of Crystal’s success? Nothing is too much trouble, the rule of the ship being the first crew member asked a question by a passenger has to deal with it and make sure there is a positive result. This can even be the Captain. There is no tipping and for the most part drinks are free. Likewise the speciality feasting, wi-fi and port transport. The whole operation is extremely smooth and hassle free. Cruises should be as stress free as possible. One wants a truly relaxing holiday. Dealing with extras and signing for every additional item can be a nuisance. Even getting on board is very easy. One’s bags are collected at the port reception, emigration is quickly passed through, as is security (and the essential anti-virus spray) and you are on board with a glass of Champagne in hand. Here the check-in is completed (most has already been done online – either personally or by the travel agent) by specially trained ship’s staff who know the product, and can quickly deal with any problems. Unlike major international hotels (particularly in London) where staff are recruited on a short term basis, Crystal personnel come on a 12-month contract, are keen for re-engagement, and never bothered about the length of their shift. Your editor in chief had not been on Serenity since January 2011 when for him it set new standards for a seagoing holiday. In November just gone the ship looked as bright and youthful as ever (some US$50m has been spent in recent times) the significant change being the removal of the little used indoor swimming pool with its sliding roof, the area is now Tastes, with an open kitchen and teak decking, sleek stretched taupe canvas ceilings over the waterside tables, and angled blocks of light and dark stone, ceramic and mosaic tiles helping define the space. While Tastes is open during the day for a ‘Late Risers Breakfast’ and lunch, after 18:00 the restaurant is transformed into a cool and casual evening eatery. It offers cuisine with accents from around the globe. An Alsatian Tarte, Tunisian Crab Warka, California Street Tacos and North African Lamb Dumplings share the bill with a dozen other inventive small plates that are designed to be shared. Also nearby is the Trident Grill for daytime casual noshing and the ever popular Scoops ice cream bar, open from dawn to dusk, a courtesy offering and with few children on board easily accessible. The other noticeable improvement is the Lido café. No trays are available. It is sort of self-service, but does not have to be. Waiting staff are always on hand to help as you request your choice across the counter from the galley staff. 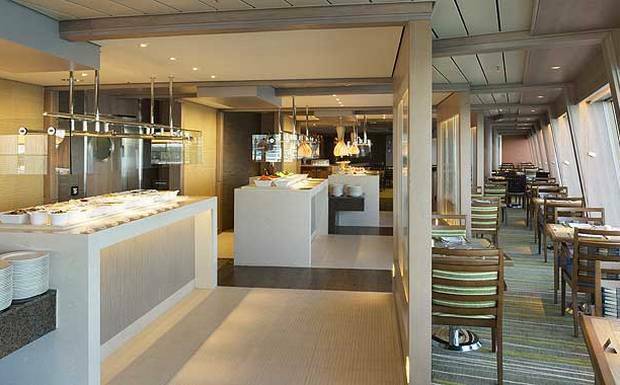 As with sister ship Crystal Symphony, Crystal Serenity’s Lido Café has been redesigned with modern food islands (instead of long buffet counters), more tables for two and a live, open kitchen which includes a bakery. You can sit out in the open over the stern. The interiors of the four butler-serviced, 1,345sq ft Crystal Penthouse residences completely reconfigured. The dining area has been moved closer to the floor-to-ceiling balcony windows and an area released now holds a den/library/media room with a sleeper sofa and closet. With a new shower added to the guest powder room, the space can function as a second bedroom, ideal for families. A butler’s pantry with private entrance adds to the comfort. The standard Penthouses (from 403sq ft), again with a butler (your editor in chief was upgraded to this superb nine-day residence) are outfitted with light settings allowing you to set the tone exactly as required. There is a large Bose VideoWave III flat screen television, iPod docking stations and surround sound audio system. Tea and hors d'oeuvres are served in your room at 16:00 if you can find space or, better still in our opinion, adjourn to the Palm Court, sitting over the bow, and enjoy traditional tea in one of the nicest rooms at sea. A first in the industry are 48 hypoallergenic luxury staterooms offering a comprehensive, chemical- and odour-free indoor environment solution. With a state-of-the-art medical grade air purifier discreetly installed to filter out 99.9% of all airborne impurities on an ongoing basis, guests can expect relief from allergies and more sound sleep, thus enhancing the overall relaxation and recuperation expected from a holiday. Shoe shining and pressing is complimentary, the room service menu (available for all grades) is extremely comprehensive and during dining hours the restaurants' offerings are available, and that includes Prego, Italian and wonderful, plus Silk Road and the Sushi Bar, for those who prefer eastern cuisine. During the day Crystal offers a busy agenda, with the latest movies in a proper cinema and the Crystal Visions Enrichment Program, with world renowned experts and celebrities covering a variety of subjects Earlier in the year Archbishop Desmond Tutu was aboard Serenity from Perth to Cape Town, part of the ship’s World Cruise. Our Special Interest Lecturers included Brigadier General (Ret) Nick Halley, a veteran of Vietnam and Desert Storm, and also CNN’s Senior UN correspondent Richard Roth, the voyage troubled by the events in Paris. Halley and Roth complimented each other. You can learn how to make the use of your iPod, take in wine lectures, cooking demonstrations, or allow your golf swing to be evaluated by a member of the PGA. Something for everyone. And single ladies are catered for by Crystal’s renowned Ambassador Hosts, carefully screened gentlemen, well-travelled and accomplished ballroom dancers. 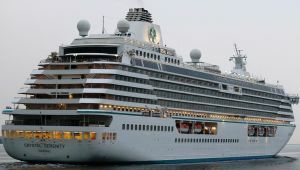 Now part of the Genting Group (GHK) (see BTN 6 July), Crystal Cruises, has opened sales for its high class river cruise programme. The recently acquired and redesigned Crystal Mozart will sail in July 2016 and the four newly built vessels, Crystal Bach, Crystal Debussy, Crystal Mahler and Crystal Ravel will embark in June and August 2017. Crystal says its innovative programme will offer a fresh take on traditional river cruising, focusing on longer and overnight stays and daytime cruising, in addition to sailing less-travelled routes to avoid congestion of other vessels in port. Cunard has released more detail of its extensive refit of Queen Mary 2 from 27 May to 21 June 2016 featured in last month’s BTN cruise edition. Besides the major Club Britannia work noted the Kings Court casual dining area is being completely transformed with a more open, intuitive central buffet area and reconfigured seating arrangements to create a relaxed self-service experience with a refined, yet informal ambiance. Enhancements are planned to both the service and culinary offerings in Kings Court with the refreshed venue featuring new menus, the convenience of pre-set tables and waiter-served drinks. The popular Chef's Galley area, serving Italian pastas and pizzas for lunch, will also offer a Chef's Table tasting menu on select evenings. Hosted by the Executive Chef, the Chef's Table will offer guests the opportunity to hear insights and recipe tips while enjoying a tasting menu expertly paired with fine wines. Thomson Cruises has unveiled plans for its brand new ship, Thomson Discovery, formerly RCCL’s Splendour of the Seas, including a whole host of dining options. Customers will have eight dining venues to choose from, including two new signature restaurants – Snack Shack and Gallery 47˚. Located on the pool deck and themed around brightly coloured, iconic British beach huts, Snack Shack is a fun, ‘festival-style’ eatery serving grill foods such as quesadillas, and nachos during the day and popcorn and cocoa on film nights. The second signature venue is Gallery 47˚, located in the upstairs of the main restaurant, this venue serving contemporary Italian food. The ship’s exterior will also receive a brand new look and feel, guaranteed to turn heads in port. The dynamic wave design accentuating the sleek hull profile and echoing the Thomson aircraft livery which also uses a wave design.